For a start up inflatable rental business, it can be difficult investing in a ton of inventory. A smart business move is to invest in a few low cost inflatables that will bring in business, then expand inventory with time. 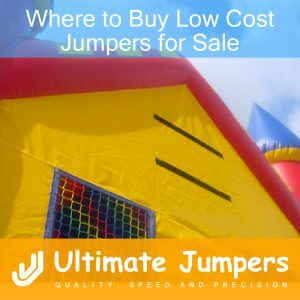 If you run a rental business and need to know where to buy low cost jumpers for sale, look no further than UltimateJumpers.com. There is no question that the most in-demand type of inflatable is the jumper. Inflatable jumpers are the most popular form of entertainment for all kinds of events. This is because they entertain kids for hours on end with breaking the bank. In addition, unlike inflatable water slides, inflatable jumpers can be used all year round, weather permitting. For all of these reasons, it is a great idea to buy low cost jumpers for sale as a start-up jumper rental business. As an inflatable rental business, it is a good idea not to invest in a ton of different types of inflatables all at once. By investing in a few variations of the most popular type of inflatable, the jumper, you are setting yourself up for success. In addition, the low prices offered by UltimateJumpers.com cannot be beat. One of the most professional jumper manufacturers where you can buy low cost jumpers for sale is UltimateJumpers.com. As a company who puts safety and quality first, you will be convinced that your purchase will last for years. In addition, UltimateJumpers.com offers amazing warranties on their jumpers. Once you learn where to buy low cost jumpers for sale at UltimateJumpers.com, you will have the first step to an amazing business investment!